Excellent puzzle game, let down only by the fact that there seems to be no sound present. 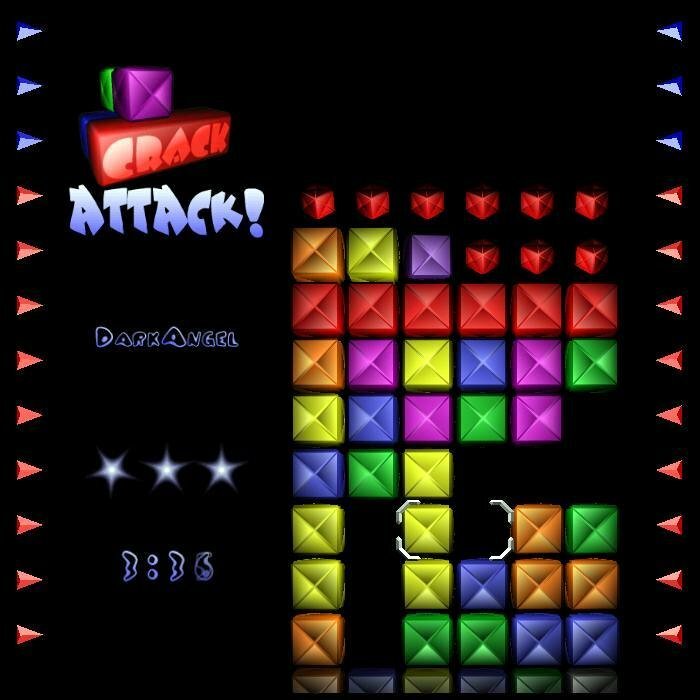 Crack Attack is an excellent, fast paced puzzle game in the same vein as Columns and Tetris. 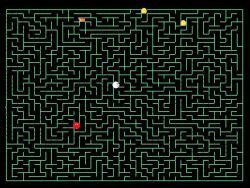 The game play is simple, but as with all great puzzle games, extremely challenging at the same time. The aim of the game is simple – line up 3 or more of the same colored cubes and they disappear. 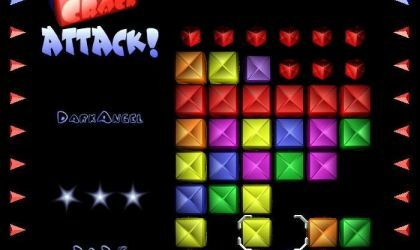 Instead of the cubes falling down the screen, as in most other games of this type, they slowly creep up the screen, line by line. If you destroy too many cubes simultaneously, large unmovable bricks fall from the top of the screen to hinder your progress. These can be removed, simply by destroying a column or row of 3 or more cubes, connected to the unmovable brick. 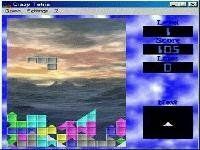 Once this is done, the brick turns to cubes, filling up the screen and increasing the difficulty of the game. It won’t take long for you to be frantically searching for lines of 3 that will get you out of a tight spot. Graphically Crack Attack is rather impressive. It has very classy graphics, nice soothing colors accompanied by a slightly ‘3d’ look, which enhances the game quite considerably. Oddly I could hear no sound while I played this – it is one of the few let downs of what is otherwise a pretty darn good game. Technically speaking, there are not a lot of options to tweak the game play, as there are in some other games similar to this, but I found myself coming back to this game time and time again. Why? Simply, because the game play is really addictive and polished. It does not feel like a ‘rushed’ clone, like so many games of all genres do nowadays. A lot of effort has been put into this and it shows. It does not contain levels to wade through – just one continuous mode that gets very difficult and a high score table that is very hard to top. Even without sound, I would highly recommend this game, although I can’t give it quite as higher mark as I would like to. If it had sound, I would be tempted to say that this is a must have for puzzle fans. My final advice – download, play and enjoy. This game is very good. Easy to play but not easy to get a good score. Graphics are beautiful. Moreover, you can play through a network with a friend for a battle. 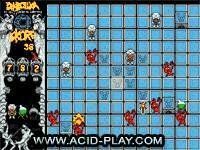 If you like puzzle games, you'll love Crack Attack. Thanks to you Daniel Nelson for this game. Great way to kill time and extremely addictive.